The number of attacks on Ukrainian army positions in ATO zone in the East of Ukraine goes up everyday. In the last 24 hours Russian terrorists violated cease-fire agreement 60 times all along the contact line using heavy weapon. Most of the attacks took place near Donetsk. Today in ATO zone terrorists concentrated almost all attacks near Donetsk. There were provocative shelling at Pisky, Novhorodske, Avdiivka, Pervomaiske, Opytne and Mariinka with the use of weapon of BMP armored vehicles, grenade launchers, high caliber machine guns and small fire arms. Terrorist snipers also fired at Pisky. Shchastya city located near Lugansk was shelled with grenade launchers. In total from 6 am till 6 pm terrorists fired in the direction of our positions 23 times. 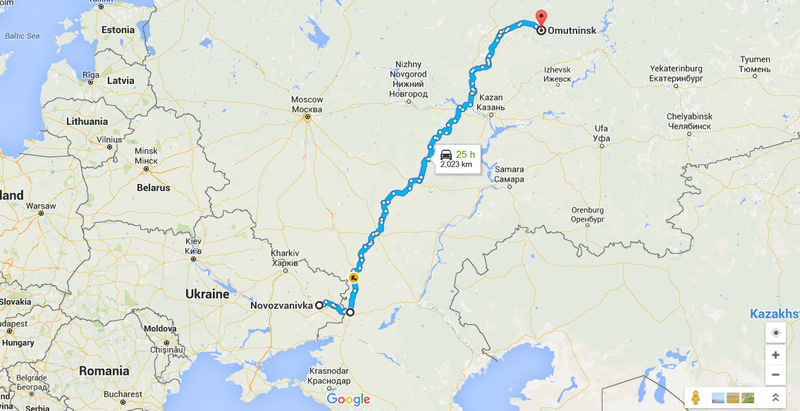 22 times out of 23 near Donetsk. The total number of cease-fire violations in the last 24 hours bases on ATO Press Center reports is 60. The locations mentioned in the report where attacks were registered are marked on the map below. 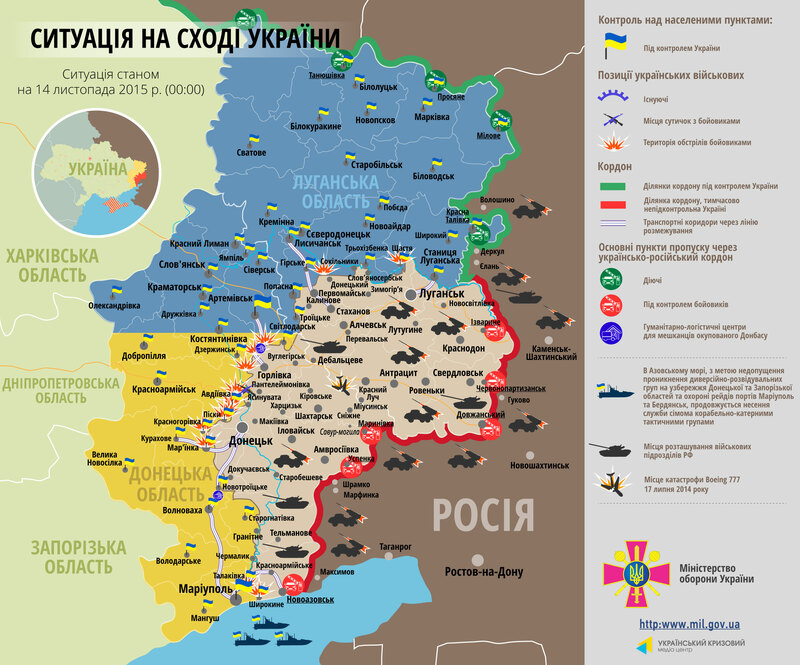 ATO Press Center released another report today on the situation in the East of Ukraine. In total Russian terrorists violated cease-fire agreement 47 times in the last 24 hours. They started sporadic provocative fire and also attacked Ukrainian fortifications using grenade launchers and weapon of BMP armored vehicles. 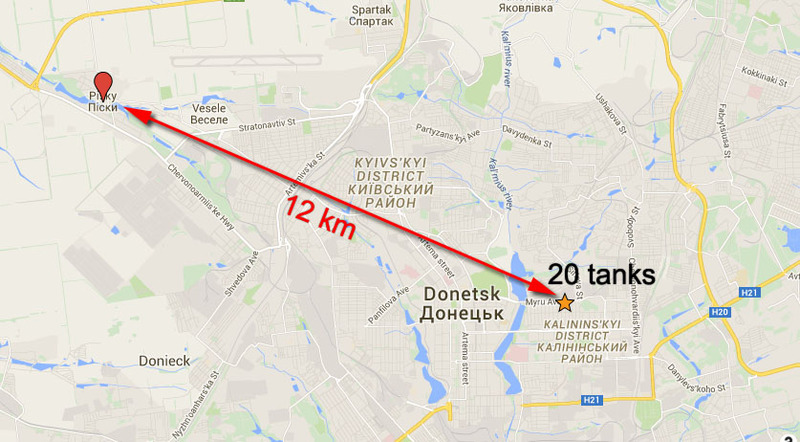 Today, same as previous days, Russian-terrorist mercenaries made most of attacks near Donetsk. They opened sporadic fire in the direction of Avdiivka, Opytne, Krasnohorivka, Novhorodske, Mariinka and Pervomaiske using grenade launchers, high caliber machine guns and small fire arms. They also fired twice in the direction of Lozove and Troitske using grenade launchers and high caliber machine guns. In total there were 17 cease-fire violations registered, 2 of them in Artemisk direction and 15 near Donetsk. The situation in ATO zone remains tense. Starting from 18:00 yesterday and till now Russian-terrorist mercenaries fired 30 times. They fired sporadically 15 times near Donetsk. Militants fired in the direction of Avdiivka, Nevelske, Troitske and Krasnohorivka using weapon of BMP armored vehicles, grenade launchers, high caliber machine guns and small fire arms. In Artemivsk direction they fired at Luhanske, Zaitseve and Mayorsk using mortars, high caliber machine guns and small fire arms. 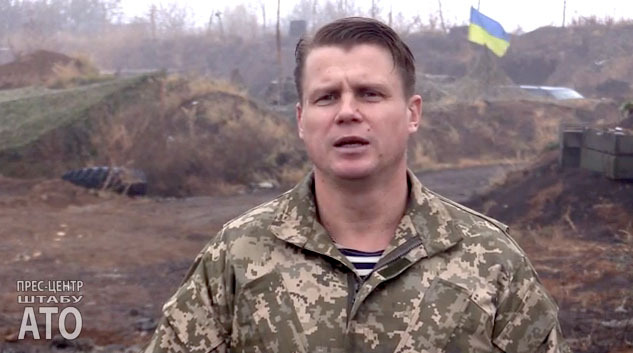 They used 82 mm mortars near Mayorsk. Terrorists attacked our positions near Troitske using 82 mm mortars and they attacked Ukrainian positions near Hranitne and Shyrokyne using small fire arms. The map below shows Ukrainian positions in Donetsk and Lugansk Regions that were attacked in the last 24 hours. The number of cease-fire violations has increased. ATO Press Center reports 37 cease-fire violations in Lugansk and Donetsk Regions on the East of Ukraine in the last 24 hours. 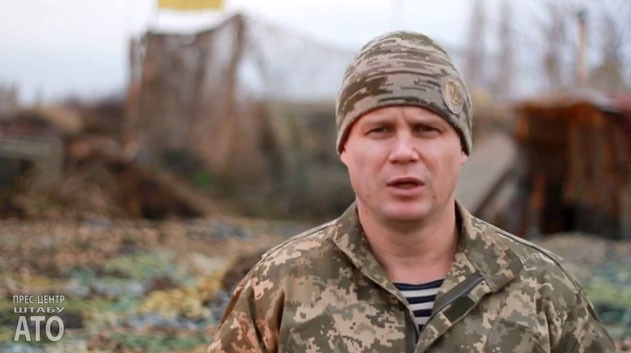 Russian terrorists used mortars, grenade launchers, machine guns and small fire arms. 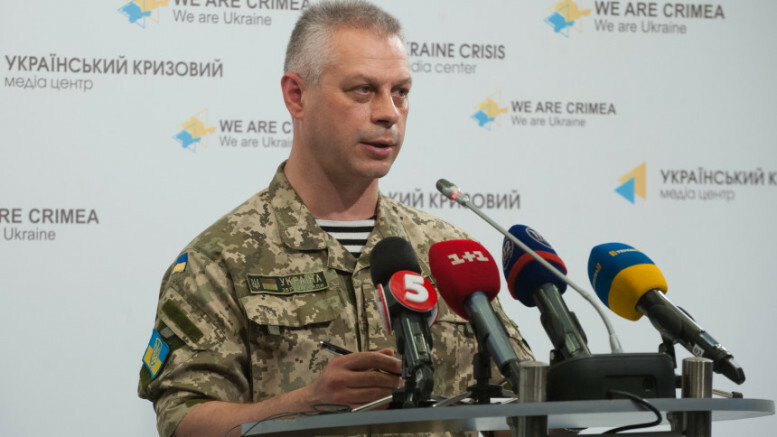 3 Ukrainian soldiers were killed by radio-controlled roadside bomb near Zolote village. Starting from 6 pm last evening and till the morning Russian-terrorist mercenaries continued sporadic fire and shelled out positions near Donetsk, Lugansk and Mariupol. Terrorists opened fire in the direction of Novhorodske, Mariinka, Opytne, Pisky and Avdiivka using small fire arms. At the same time they attacked Novotoshkivka and Shyrokyne using mortars, grenade launchers, high caliber machine guns and small fire arms. In total from yesterday evening till today morning mercenaries opened fire 16 time, 5 times attacking out positions. Today from 6 am till 6 pm Russian-terrorist mercenaries opened fire 21 times in the direction of our positions near Donetsk and Artemivsk. Putin’s mercenaries shelled Zaitseve and Mayorks using grenade launchers, high caliber machine guns and small fire arms. Using same type of weapon followers of so-called “Russian World” shelled Nevelske, Pisky, Krasnohorivka and Mariinka. They attacked our positions near Zaitseve and Krasnohorivka using 82 mm mortars. 3 Ukrainian soldiers got killed by radio-controlled roadside bomb near Zolote village in Lugansk Region. ATO Press Center reports 43 cease-fire violations in ATO zone of Donetsk and Lugansk Regions in the last 24 hours. Terrorists used mortars, high caliber machine guns, grenade launchers and small fire arms. 1 Ukrainian soldier was killed and 8 were wounded. Ukrainian military also posted a video of MRLS launch that took place previous night from the territory controlled by pro-Russian terrorists of so-called Donetsk People’s Republic. ATO Press Center made 2 reports. Each report covers 12 hours and in total there were 43 cease-fire violations registered. Below we post each report as it is translated in English. The report on casualties is made National Security and Defense Council of Ukraine is posted at about 1 pm covering previous 24 hours. Starting from 18:00 yesterday evening terrorists continued provocative attacks on our positions in Donetsk, Artemivsk and Mariupol directions. Near Donetsk mercenaries opened fire in the direction of our positions near Novhorodske, Mariinka, Krasnohorivka, Pisky, Avdiivka and Opytne using grenade launchers, high caliber machine guns and small fire arms. Near Artemivsk they opened fire in the direction of Zaitseve, Luhanske, Popasna, Mayorsk and Lozove. Near Mariupol and Lugansk terrorists opened fire at Shyrokyne and Stanytsia Luhanska using small fire arms. In total starting from yesterday evening and till today morning there were 30 cease-fire violations registered. On November 15 Russian-terrorist mercenaries continued military provocations in ATO zone. Today they were shelling our positions near Donetsk using grenade launchers and small fire arms. The worst situation was at Pisky, terrorist attacked that village 10 times, and they also used 82 mm mortars. 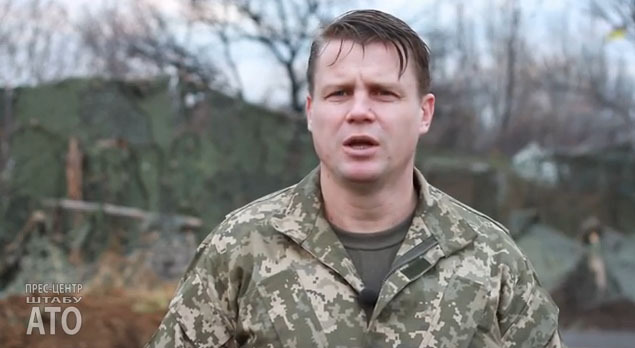 Terrorists also fired at Opytne and Krasnohorivka. Near Mariupol followers of so-called “Russian World” were attacking our positions near Hranitne. In total terrorist shelled our positions 13 times. The worst situation was near Donetsk Airport. Illegal armed groups cynically violated cease-fire agreement and shelled Ukrainian fortifications near Avdiivka using 120 mm mortars. As a result of that attack 1 Ukrainian soldier was killed and 8 soldiers were wounded. Mortars that were used during the attack were hidden in Putilovsky Forest, one of the parks of Donetsk. ATO Press Center also posted a video of MRLS attack on Ukrainian army positions at Krasnohorivka that took place on November 13 at 2:38 am. On the video there are three rocket launches from Staromykhailivka village controlled by Russian terrorist troops. Pro-Russian terrorists increased the number of attacks on the East of Ukraine. Just in the last 24 hours 5 Ukrainian soldiers were killed and 4 more wounded. 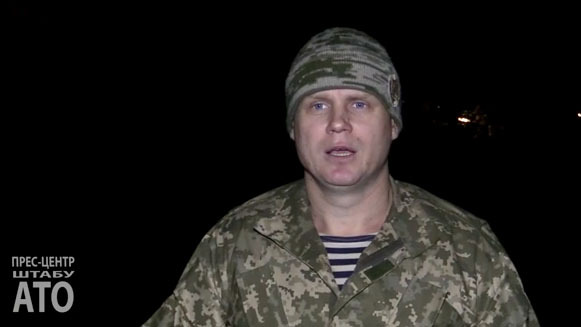 Militants used 82 mm mortars, BMP armored vehicles and grenade launcher. Starting from 18:00 yesterday Russian-terrorist mercenaries continued shelling our positions in all directions. Terrorists opened provocative fire near Donetsk at Opytne, Pisky, Mariinka, Novhorodske, Novoselivka Druha, Verhnyotoretske, Krasnohorivka and Avdiivka using BMP armored vehicles, high caliber machine guns and small fire arms. Also terrorists used 82 mm mortars shelling Avdiivka. On Artemivsk direction terrorists shelled Mayorsk using high caliber machine guns and small fire arms. On Mariupol direction they attacked Lomakyne using small fire arms. Also mercenaries attacked our positions near Novotoshkivske and Shyrokyne. There was an attack on Ukrainian positions at about 20:00 near Verhnyotoretske village, the enemy retreated from the battlefield. During 2 hours fight Russian-terrorist forces used not only BMP-2 armored vehicle, high caliber machine guns and small fire arms, but they also use 82 mm mortars that should be withdrawn from the contact line according to Minsk Agreements. Lugansk Regional State Administration posted more details about terrorist attack on Ukrainian positions near Novotoshkivske. See original report in Ukrainian at www.facebook.com/odalug. Yesterday near checkpoint #29 located close to Novotoshkivske village saboteur group of about 9 men were trying to break through the front line. 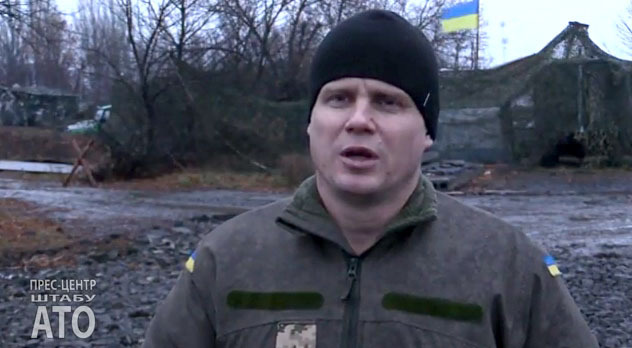 Militants were trying to pass by the checkpoint by a path near the checkpoint. As a result soldiers of 24th brigade got in a fight. There were no killed or wounded from the Ukrainian side, one terrorist was killed and two more were wounded. Militants were running so fast that they left one of the killed terrorist in the forest. Probably those were same terrorists who were saying that they managed to put their flag near the checkpoint. Our soldiers pushed them back. I think that now saboteurs of militants will know that any of them can die for the rag that they put near the checkpoint. 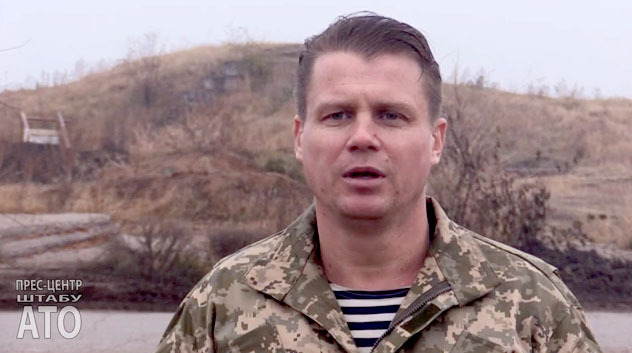 General Staff of the Armed Forces of Ukraine revealed identity of one of the terrorists who was killed in the recent attack on Ukrainian Army positions. That was Russian citizen who had veteran status since 2005. The attackers left his body on a battlefield in Lugansk Region. The reports says that late at night on November 10 Ukrainian soldiers spotted enemy reconnaissance group of about 15-20 men in ATO zone near Novozvanivka village located in Lugansk Region. At 22:00 Russian-terrorist mercenaries tried to attack our soldiers near Novozvanivka. When saboteurs got closer the commander made a decision to open fire. The enemy retreated and tried to go around at the left flank. Ukrainian soldiers opened fire again. Enemy retreated taking wounded and killed with them. After reconnaissance group got closer to Ukrainian soldiers positions a fight started, as a result the enemy retreated. After that militants tried to get to the back of Ukrainian soldiers from the left flank, but they were pushed back again and retreated with casualties. 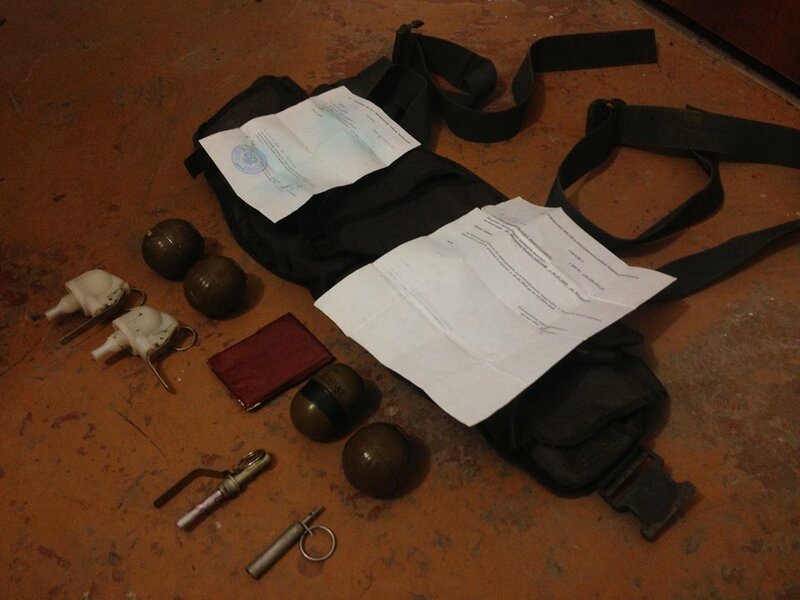 Ukrainian military found a body of killed terrorist and some documents. 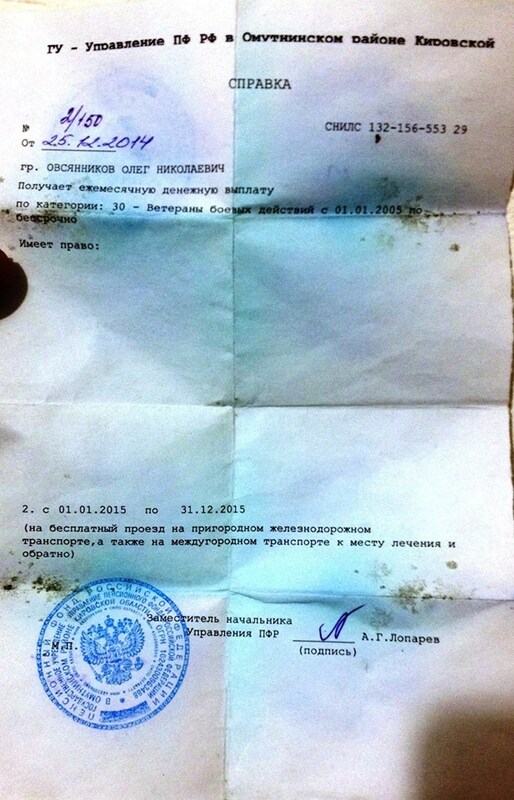 The name of that person is Oleg Ovsyannіkov and he was military veteran since 2005, documents were issued in Kirovskiy Region of Russian Federation in Omutninsk city located about 2000 km from the Ukrainian village where he was killed. He also had 4 grenades and other equipment for planting mine traps. 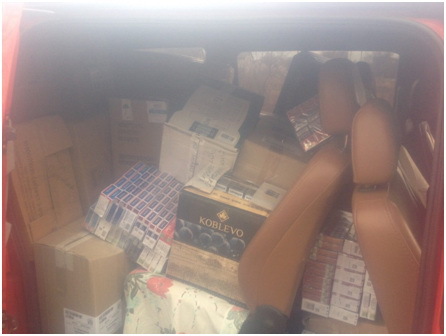 Security Service of Ukraine stopped two vehicles with cargo in ATO zone near Novobahmutivka village in Donetsk region. A minivan and a car were trying to get to the territory of so-called Donetsk People’s Republic avoiding checkpoint. 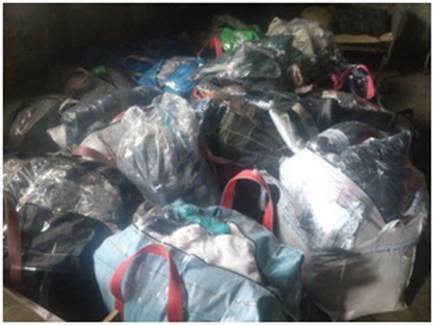 The total cost of cargo was over 750 thousand UAH, there was clothes, shoes and perfumery. Also Security Service stopped cargo truck near Peredilske village in Lugansk Region. 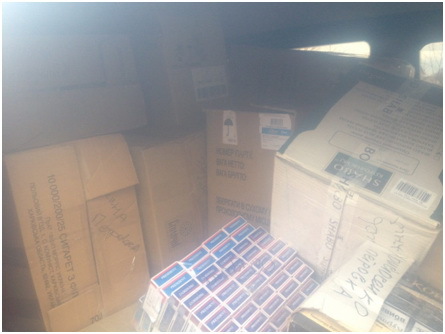 The driver was trying to deliver cargo to the territory occupied by terrorists of so-called Lugansk People’s Republic, there were cigarettes worth about 150 thousand UAH. Security Service investigates who organized illegal traffic. 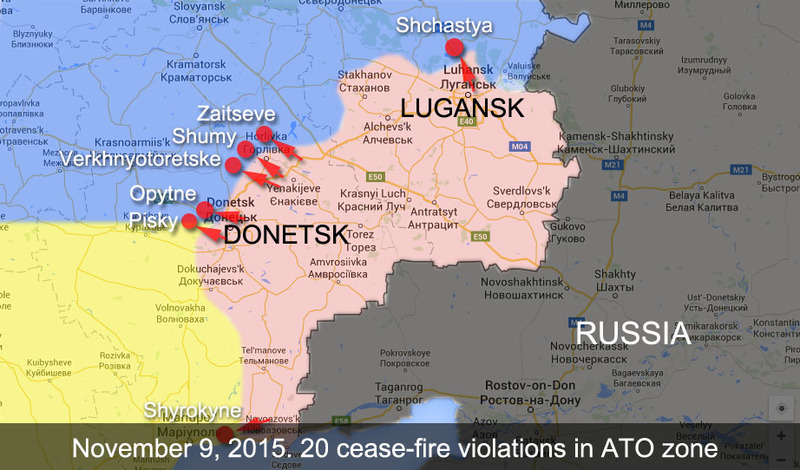 ATO Press Center reported 20 cease-fire violations in Donetsk and Lugansk Regions. 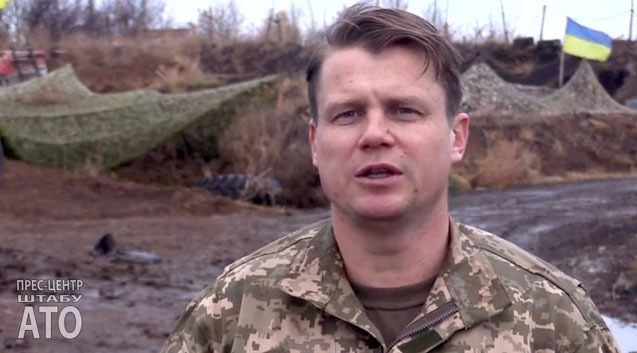 Ukrainian soldiers didn’t return fire following Minsk Agreements. In the last 24 hours the situation in ATO zone was not quiet. Terrorists violated cease-fire in all sectors. Starting from 6 pm last night they attacked Mayorsk, Zaitseve and Shumy in Donetsk Region using grenade launchers, high caliber machine guns and small fire arms. In Lugansk Region they attacked Ukrainian positions near Shchastya city using grenade launchers and small fire arms. Enemy sniper was shooting near Shyrokyne located not far from Mariupol. Terrorists also used armored vehicle BMP-2, grenade launchers, high caliber machine guns and small firearms at least six times attacking Ukrainian positions near Pisky, they also opened fire near Verhnyotoretske, Krasnohorivka and Opytne.